It has become a tradition in the Netherlands, for integral urban developments, to include the cultural and/or culture-historical dimension in an early stage of the planning process.3 This is also the case for the Zuidas development. In this instance, the Zuidas Project Bureau has invited cultural actors to actively participate in the conceptualization of the development of an artistic climate in the area. As the Zuidas Project Bureau formulated it, ‘. . . we want an inspirational and lively artistic climate in the Zuidas. When you say “Zuidas” a few years from now, we want people to think of art.’4 This has led, among other things, to the 2003 founding of the Zuidas Virtual Museum, a foundation consisting of prominent figures in the Dutch cultural world.5 Their ambitions include turning the Zuidas into ‘a kind of museum’, ‘a place within which new art forms can be created’.6 This foundation has launched various initiatives, including a plan for a design museum and arts centre as well as a programme aimed at safeguarding the integral, architectural qualities of the area. A crucial element of this internal resistance is a proper insight into the forces cultural actors have to deal with, as well as the nature and logic of the planning process in which art is asked to participate. The first and longest section of this essay, indeed, consists of an analysis of the political-economic and ideological processes behind urban-design developments like the Zuidas. From this analysis, a counter-strategy is outlined. To the cultural actors who want to keep far away from such developments, and dismiss them as discussions external to artistic practice, we can only say that those who do not first work through the determinative conditions of their own production lose the right to pontificate about cultural engagement. In such a case, the sempiternal complaints about the misuse of art as the ‘wallpaper’ of economic development – whereby the critical intentions of the artistic sector are continually neutralized – are merely an empty gesture. Neoliberal planning . . .
An oft-heard justification for the development of Amsterdam-Zuidas is that this kind of monolithic, antisocial urban development is the logical consequence of a situation in which the real estate sector and financial capital have been given free rein. This is supposedly the result of the rapid dismantling and retrenching of the Dutch state in the wake of the Purple Coalition debacle in the 1990s – manifested in the area of spatial planning by the abandonment of ‘bloated’ government planning. In short, the unabashed development of the Zuidas into a new work and residential ghetto for the top segment of society is supposedly a symptom of the unstoppable rise of a neoliberal policy based on the ‘laissez faire laissez passez’ principle or, what amounts to the same thing, the idea that ‘the market regulates itself’. Nothing could be further from the truth. The government authorities involved – in this case the city of Amsterdam and the Dutch state – are two of the most passionate promoters and champions of Amsterdam-Zuidas!9 The development not only fits in perfectly with Amsterdam’s efforts over many years to establish itself as a top international city – think for instance of the recent ‘Amsterdam Topstad’ campaign –10 it is also, for the state, one of six ‘key projects’ intended to put the Netherlands on the international map.11 What’s more, Zuidas-Amsterdam is the largest of these key projects, involving a state investment of 653 million Euro. To start with the first (‘what are these opportunities?’) we can refer to the observation of social geographer Erik Swyngedouw on the role of the government within the neoliberal development of the Zuidas. He argues that ‘. . . contrary to what its ideology holds dear, conservative liberalism has always maintained a very unique and intimate relationship with state intervention . . . Planners and local authorities adopt a more proactive and entrepreneurial approach aimed at identifying market opportunities and urging private investors to exploit them.’19 In short, when the government talks about creating and taking advantage of opportunities, it primarily means economic opportunities. Viewed from this perspective, democracy fits perfectly, of course, in its neoliberal agenda. Aside from the issue of unequal means, the problem is also that citizens, unlike businesses, often do not necessarily have an entrepreneurial or exploitative relationship with their city. It is this non-economic relationship – driven by different values: ecological, moral, even political – that is not tolerated within the neoliberal form of urban development. In the latter, all stakeholders (including the government) are reduced to ‘merely’ one of the discussion partners who must be prepared to negotiate their desires in a transparent, economic negotiating process. A protectionist government policy in favour of vulnerable sections of society – which, driven by democratic ideals, offers them certain privileges in the negotiations – is of course entirely out of the question. Within the negotiation process, the only idealism allowed is the calculation of mutual interests. What is denied here is, again, the unequal balance of power – or sometimes even the relationship of dependence – that exists among the various discussion partners at the negotiating table. Let us begin with the first cluster of questions, relating to the new alliance between government authorities, market partners and cultural actors. This alliance can seem unconventional or even progressive. Where else in the world do artists get a chance to exchange ideas with property magnates about a brand-new city centre? This seems already less so when we assess it against the backdrop of the current tendency to present culture or cultural history as an indispensable asset for a strong city or region. Aside from creating a so-called creative city, it is also considered crucial for creating an attractive location climate for multinational corporations. The most often cited justification for this is that the employees of (international) companies, because of their high levels of education, set particularly high standards for their living environment. Factors such as spatial quality, a diversity of cultural venues, a rich history, a tolerant social climate, etc., are deciding factors in convincing this elite to commit to a city. In fact, culture or cultural history – think of the recent hype about cultural planning – is undergoing the same fate as the environment: it too is being fully adopted as a necessary determinative condition in spatial developments. For years it was considered a nice extra – when it was considered at all. Today, on the contrary, the presence of a rich cultural history or a fertile cultural climate, for the reasons outlined above, is seen as an indispensable added value for the success of a spatial planning development. The market and the government in fact attempt to integrate this explicitly in the city’s planning. It is in this light that we must understand the ambition of the Zuidas Project Bureau to excel both in the area of popular culture venues – by using popular theatre guru Joop van den Ende as an ambassador and standard-bearer of the development – as well as in the more difficult quest for ‘new art forms’ – a commission laid at the door of the Zuidas Virtual Museum. Whether cultural forces should be happy with its internalization as a market factor – apart from the issue of whether it is at all possible to plan anything as fragile and obscure as a ‘fertile cultural climate’ – remains very much to be seen. In the first place, it reduces their specific activity to the object of a market deal and therefore to a form of capital: that is, cultural capital. Analogous to the ‘red for green’ arrangements, the economic colonization of the last ‘uncapitalized’ spaces in the city is exchanged or traded for generous compensations to the cultural sector, so that we can rightly speak of a ‘red for culture’ arrangement. The hand being extended to the cultural sector is also clearly motivated by a fear that if the Zuidas development is left entirely up to the government and the real estate sector – if the Zuidas Project Bureau leaves it up to itself, in other words – it will remain deprived of the exciting malfunctions and frictions that are so essential today in seducing the highly demanding, internationally operating high-income earner. Philosopher Slavoj Zizek once described the latter as a yuppie who has his financial affairs well in order, but who still cultivates an alternative, anti-capitalist aura.24 A project development exclusively targeted to these groups cannot avoid incorporating this aura in its plans. The Zuidas Project Bureau clearly believes that no one can better stimulate such an image than the cultural actors. These cultural actors are subsequently expected to dress up an intrinsically capitalist development in an anti-capitalist, ‘critical’ package. The prominent position accorded to culture within neoliberal planning must be understood as a compensation for the political sector giving up its political task. We can see this as an example of what is known in psychoanalysis as ‘transference’.25 The latter can be described as a trick to resolve an internal crisis – for instance the perceived impossibility of doing anything – by passing it on to someone else. A typical example of this is a socially inhibited, timid person who consistently associates with more extrovert personalities, because the directness of the latter obviates the need for him to express himself. This transference relationship takes place, of course, on the unspoken condition that the Other, the object of transference, continues to play his part. Well, the division of tasks among the neoliberal, ‘enterpreneurial’ government and cultural actors – as enshrined in the Space and Culture Action Programme – is equally characterized by this sort of transference. The cultural forces, for instance, are expected to politicize the little public space left to us and assign it critical value. In this way, the government fobs off onto the cultural forces what it itself considers impossible: that is, doing anything– within current global conditions – other than cater to the needs of big business. In short, with the neoliberalization of planning, the only way the government still acts as the keeper of the public interest and social justice lies in allocating a budget for art and culture. To put it another way, its only political act consists of creating opportunities for others to do something in which it no longer believes. This can take the form of the allocation of a sum of money, the necessary infrastructure or even know-how to cultural actors. In this way, the general lack of faith in the possibility of a radically democratic city is compensated by ascribing magical powers (and big budgets) to cultural projects that enthusiastically and – from the entrepreneur’s standpoint – even naïvely focus on reconquering the urban public space or the allocation of a place to excluded groups. Art and culture are elevated to the alternative stage upon which things that do not easily fit into the interests of the market are still possible. If today’s neoliberal government, in spite of its superficial blather about democracy, still possesses any idealism, it is an ‘outsourced’ idealism. It has neatly transferred its faith in politics to the cultural sector and even expects a political act from this quarter. For an answer to this question we can take inspiration from Slavoj Zizek and his contention that in the present post-ideological era, in which every ideal is negotiable and is subjected to the demands of flexibility, a policy maker with an ethical sensibility has become the exception.27 This is a person for whom flexibility belongs to the economic sphere and is not relevant to issues related to the public interest. It is precisely the appearance of such a person ‘with a backbone’ that has become so traumatic today. Think of the controversy surrounding the Dutch soldier who refused to take part in the Dutch peace-keeping mission in Afghanistan. Although he justified his refusal by arguing that the Dutch army was not adequately prepared, he nevertheless made explicit what everyone already knew: that the mission is part of a new wave of imperialism. The traumatic, and therefore effective, aspect of such a position was illustrated by the recent television appearance by Dutch landscape architect Adriaan Geuze in a documentary about the shrinking of the Groene Hart – the ‘Green Heart’, a large area of natural beauty and agricultural land in the middle of the Randstad urban conglomeration in the west of the Netherlands.30 He strenuously protested against the surreptitious yet systematic disappearance of the Groene Hart, as all kinds of interest groups have been taking bites out of it for years. Not only is this leading to a rapid fragmentation of the Groene Hart, but this increasing ‘fragmentation’ only leads to its very existence being increasingly called into question – for why hold on to the Groene Hart if it is only a fragmented, inconsistent pile of ‘greenery’? In the face of these ‘societal developments’, Geuze made an impassioned and uncompromising appeal for the integral preservation of the Groene Hart. We need hardly explain that Geuze, with this inflexible attitude, attracted the fury of the entire right-minded planning community. One counter-criticism often expressed by his interlocutors was that he ignored the ‘inevitable’ societal trends that were leading to the dismantling of the Groene Hart. For instance, Joost Schrijnen – director of spatial planning for the Province of South Holland – flatly stated that Geuze ‘had a romanticized picture in his head’. Others faulted him for his fixation on the aspect of ‘landscape quality’ and disputed whether spatial planning can be redirected to achieve this. Melanie Schultz van Haegen – Junior Minister for Transport and Water Management – resolutely argued that it was not her job to ‘beautify the country’ and that she focused solely on ‘proper management of spatial developments’. Ultimately, it was Wim Derksen – director of the Netherlands Institute for Spatial Research – who made the clearest admission of guilt, in his response to Geuze’s criticism that the institute’s study on the Groene Hart had accorded too much importance to the space demands of existing forces, allowing them to take over even more of the Groene Hart. Derksen had no answer to Geuze’s criticism except to confess that ‘in this Dutch political and Dutch planning culture’ he had ‘given up on the Groene Hart’. 2. See for example the Tegenlicht documentary ‘Planner’s blight: de strategie van het gummetje’, (http://www.vpro.nl/programma/tegenlicht/afleveringen/22966523/items/22153505/) in which André Thomsen (professor of real estate and housing management) criticizes the current restructuring of neighbourhoods in large and medium-sized cities for being mainly driven by the profit-seeking of the corporations and the dubious demographic policy of city authorities. In his view, this is based on a market outlook whereby the problem is not the housing stock in the so-called problem areas, but the residents. 5. More specifically, Simon den Hartog (former director of the Rietveld Academie) was appointed as supervisor. The website of the Virtual Museum features this text: ‘Den Hartog put together a programming council and developed a vision with a practical, implementable plan for the realization of this artistic climate. Based on this vision, the Zuidas Virtual Museum foundation was officially founded in 2003. The Zuidas area itself is viewed as a kind of museum. A constantly changing space in which art has a place and within which new art forms can be created. The Zuidas Virtual Musem is an umbrella label for temporary and permanent activities, an exhibition and exchange centre, visible as well as more invisible projects in the Zuidas.’ (http://www.virtueel-museum.nl/). 8. Think of the ‘Logo Parc’ initiative, a research project of the Jan van Eyck Academie. 9. The state is the initiator and co-financial backer of the necessary adaptation of the main infrastructure, in particular. The city of Amsterdam is in charge of planning and implementation (Ministries of Housing, Spatial Planning and the Environment, Agriculture, Nature and Food Quality, Transport and Water Management and Economic Affairs, Nota ruimte. Ruimte voor ontwikkeling, 2006, p. 44; http://www.zuidas.nl/smartsite.dws?id=570). In addition, the city and the state are also partners in the development corporation Zuidas NV, which serves as the coordinator of the Zuidas projects. Other partners include ABN Amro, ING, Fortis, Rabobank, Bank Nederlandse Gemeenten? 10. This is a joint venture with the business sector to put the city and the region on the international map. The city executive’s contribution is 51 million Euro. 13. Pieter Tordoir, ‘The economic pentagon: central business districts in the global economy: Consequences for the Zuidas development’, in Willem Salet (ed.) Amsterdam Zuidas European Space (Rotterdam: 010 Publishers, 2005), pp. 99-122. Published in :Jeroen Boomgaard (ed. 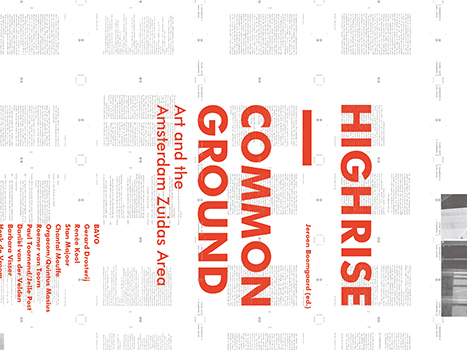 ), Highrise – Common Ground, Art and the Amsterdam Zuidas Area, Valiz, 2008.